by Deborah R. Prichard. MA Ed. Contact Author - Deborah R. Prichard. MA Ed. Debbie Prichard is an award winning educator and respected facilitator. She specializes in leadership and team development, promoting positive working relationships within corporate organizations and schools. Prichard has twice received an Outstanding Educator Award for the Kentucky Governor’s Scholars Program, is a recipient of an Ashland Oil Golden Apple Achiever Award and is a National Board Certified Teacher of English Language Arts. She is a graduate of the University of Kentucky and Northern Kentucky University. The Classroom CEO made me wonder if Deborah Prichard was going to discuss how administrators could better manipulate their employees. 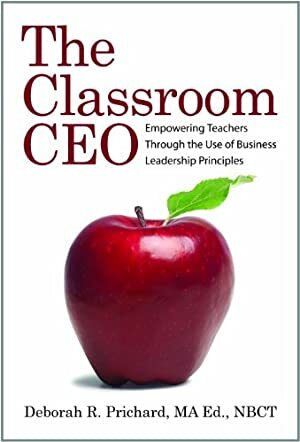 The subtitle, Empowering Teachers Through the Use of Business Leadership Principles, made me worry that a “bottom line" or "impossible accountability" would make teaching even crazier and more difficult. I was dead wrong! Debbie has written an amazingly easy-to-read, easy-to-do book that shows how to empower everyone in any organization. It does mean sharing power that many will resist. Her seven principles - purpose, performance, motivation, grace, service, flexibility, and ethics - form a philosophy in a practical handbook that can immediately empower those who understand and properly use it. I make this disclaimer because I fear many will nod their heads in agreement with the principles, but will not "share" their power to empower those with less legal power. However, this does not diminish what she has already taught successfully to others and has so clearly explained in her how-to-do-it sections. She uses lecture-information, then Your Stories, Power Up, and Your Notes to give listeners activity-based experiences to individualize their responses and reinforce the teachings. It is an excellent teaching manual. Teaching staffs, parents, administrators all can use this for group training or for individual learning from the book. If done as a staff, it could easily improve the climate of the school. I give it five stars in all categories and a head start for the education book of the year.